Periodontal disease is the leading cause of tooth loss. Gingivitis is the earliest stage of gum disease, and it is often reversible. It begins with overgrowth of bacteria due to plaque buildup, and it may progress to periodontitis if not addressed. Once the disease advances to the inner layers of the gum, the tissues begin to pull away from the teeth and form small pockets that collect more bacteria and food particles. These quickly become infected. Toxins from the bacteria eventually break down the bone and connective tissue that holds teeth in place, which leads to loosening of the teeth and eventual tooth loss. 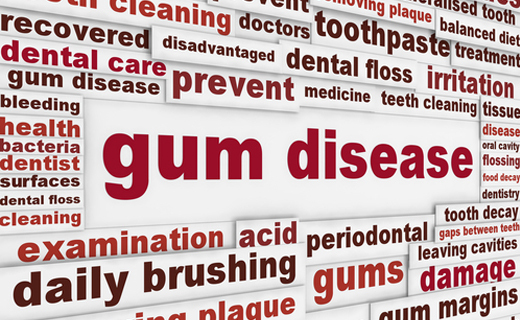 How Gum Disease is Diagnosed and Treated. Your dentist in Baltimore will check for signs of diseased gums during a comprehensive exam. Treatment depends on the stage and severity of the disease. It may include special cleaning instructions or products, medicated mouth rinses, or surgery to restore supportive gum tissues. Your Gums May Affect Your General Health. Researchers have discovered links between gum disease and cardiovascular disease, diabetes, pneumonia, and low birth weight. Prevention is Key. See your dentist and dental hygienist regularly. Early stages of gum disease are reversible. The following recommendations can help decrease your risk of gum deterioration and the rate of its progression.